In my last post, I discussed how the Julian Calendar was instituted by Julius Caesar but it had the flaw of losing a day every 128 years or so. This inaccuracy came to a head in the 1500s when church authorities finally dealt with the problem. The push to do this came from the fact that the method for computing the date of Easter uses the date of the vernal equinox. 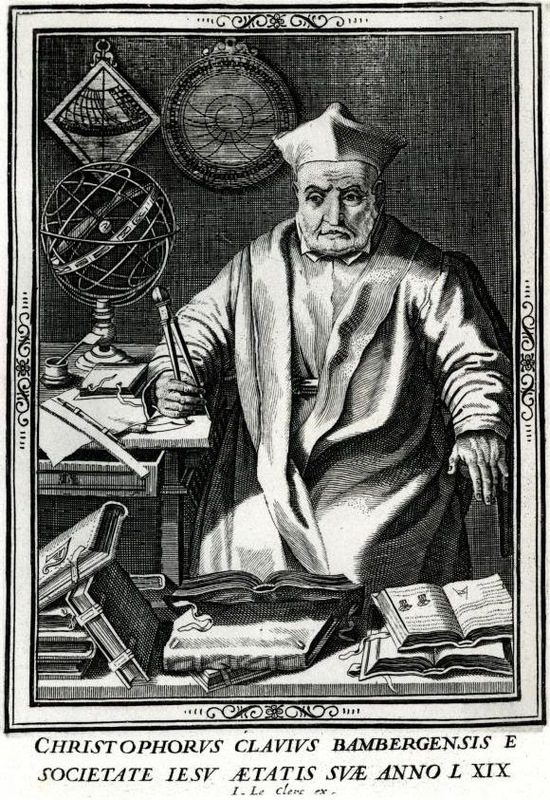 By the 1500s, the Julian Calendar was saying the vernal equinox was on March 10 instead of March 21 where it should have been and this was causing no end of confusion. Pope Gregory the XIII, with the assistance of Jesuit astronomer Christopher Clavius, developed a new calendar and the Pope issued a Papal Bull which decreed that the day after Thursday, October 4, 1582 would be not Friday, October, 5 but Friday, October 15! The loss of 10 days was necessary to align the new calendar with the actual date in the tropical year. How is this different from the Julian Calendar? Compared to the tropical year value of 365.2421897 days, this gives a difference of 0.0003103 days. Let’s calculate how many years it will take before we have an error of 1 day. In other words, the new Gregorian Calendar will lose a day every 3,223 years as opposed to the Julian Calendar error of a day every 128 years. From its institution in 1582, it will only have lost 1 day by the year 4805! 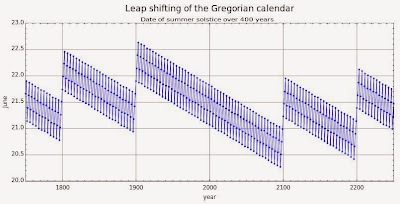 The above diagram shows how the date of the summer solstice shifts each year to fall sometime on either June 20th, 21st, or 22nd. Each dot represents the date (and time) of the summer solstice for that year. 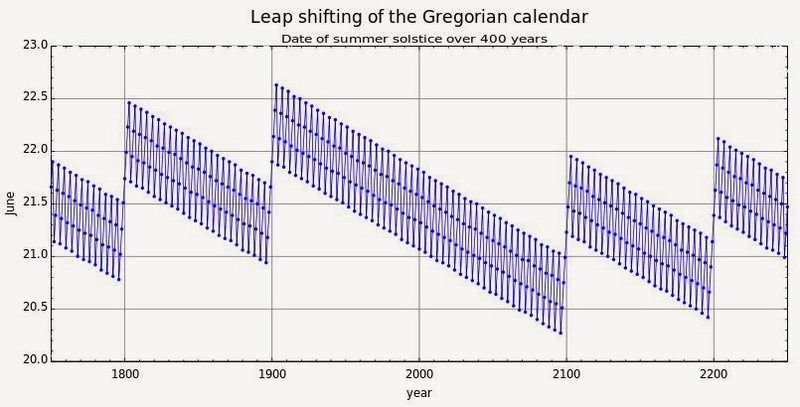 Note the shifts by a day in 1800, 1900, 2100, and 2200 (because we omit January 29 since they're not divisible by 400 so are not leap years) but not 2000 (since it is divisible by 400 and is a leap year so we keep the four year leap year sequence). 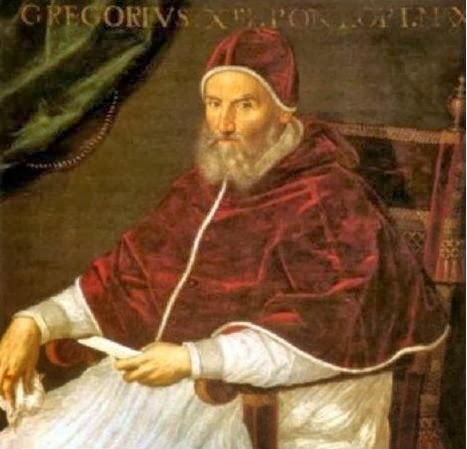 People rioted in the streets in some places over the loss of 10 days when October, 5 changed to October 15 but Catholic countries relatively quickly adopted the new calendar (the Pope still had a lot of power at that time). It took over 100 years before most of the Protestant countries in Europe abandoned the Julian Calendar. Great Britain and the American colonies didn’t switch until 1752 and in Russia, it wasn’t adopted until the Russian Revolution of 1917. One of the last major holdouts, the Eastern Orthodox Church, still uses the Julian Calendar for calculating the date of movable feasts (church holy days that don’t fall on the same date each year). When England switched (the Calendar Act of 1750), the date of September 2 was followed by September 14 in 1752. A number of people saw the change as a "Catholic plot" and reputedly rioted apparently believing the government took away days of their life chanting "Give us back our eleven day!" Others welcomed the change - Benjamin Franklin wrote "“It is pleasant for an old man to be able to go to bed on September 2, and not have to get up until September 14." 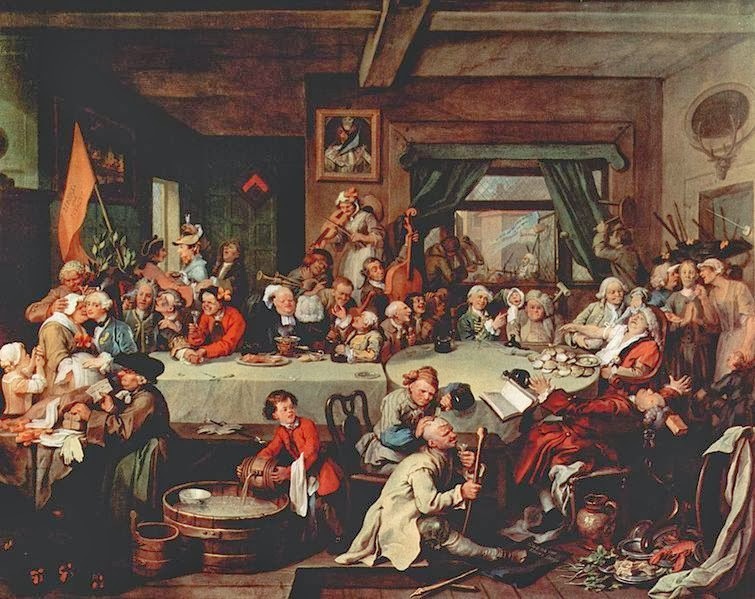 The famous painting above, according to Wikipedia, is "loosely based on the 1754 Oxfordshire elections, in which the 1752 calendar change was one of a number of issues brought up by Tory opponents to the Whig candidate for MP... 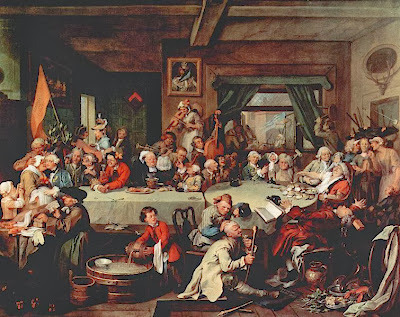 The painting shows a Whig banquet, and 'Give us our Eleven Days' is a stolen Tory campaign banner." 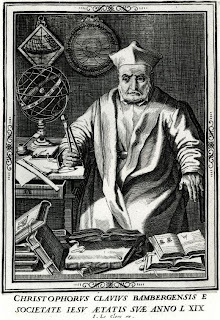 The banner is the small black square, with white writing, under the boot of the gentleman in the gray coat sitting on the floor at front. No matter what you do, a calendar will always have some accumulating error due to the fact there are 365.2421897 days in a tropical year and, worse yet, that number is an average since the shape of the Earth’s orbit varies a bit year to year and over geologic time periods.